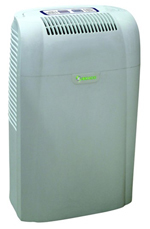 The Meaco 10L Dehumidifier is a small dehumidifier that is ideal for use in apartments, flats and other smaller homes. It is a relatively quiet dehumidifier and light in weight to make it easy to move around to suit your needs. Despite its compact dimensions this dehumidifier is powerful enough to keep your flat or smaller bungalow free from condensation and mould. The Meaco 10L Dehumidifier is offered at an exceptionally low price for such an effective unit with so many helpful feaures, including easy to use electronic controls, auto-restart, a humidistat and the capabiity for continuous drainage. As a bonus this dehumidifier will blend in with contemporary decor and has an attractive and modern appearance. The light weight and small size of the Meaco 10L Dehumidifier make it suitable for use in any room where floor space restricted. It uses only 220W of power so will not be a major addition to your energy costs. The noise output of the dehumidifier is low by comparison with many similar machines although all dehumidifiers can be heard and even a quiet dehumidifier such as this may disturb a light sleeper if it is running in the bedroom. Despite being described as an "entry level" dehumidifier the 10L boasts most of the refinements of much larger units and represents good value for money for anyone who needs a small dehumidifier for the home. This unit would not be entirely suitable for continual operation in low temperatures and we would not recommend it for use in, for example, a garage. For this type of location a desiccant model, or a refrigerant dehumidifier with an active defrosting feature would be more effective. The Meaco 10L dehumidifier is a smaller capacity dehumidifier capable of removing 10 Litres of moisture per day from air with an ambient temperature of 30°C and relative humidity of 80%. These conditions are those typically used by manufacturers to rate dehumidifiers for sale in the UK. By testing at the same, or similar conditions manufacturers have created a common bench-mark by which one dehumidifier may be compared with another. Conditions as warm and humid as the test conditions rarely apply in Britain and, as many of you are aware, the amount of water collected by a dehumidifier falls when it is cooler and/or less humid. This unit has a water collection container, or bucket, with a capacity of 2 Litres and in typical British conditions it is unlikely that you will have to empty it more than twice per day. If you are new to dehumidifiers knowing how the water collection rate varies will avoid unnecessary concern that your dehumidifier may not be working properly. The power of the Meaco 10L dehumidifier will be sufficient to control humidity in a single large room or throughout a compact home, such as a one bedroom flat/apartment. Please note that if a dehumidifier is to have an effect on more than one room the interior doors in the room containing the dehumidifier and the other room or rooms must remain completely open. All windows and exterior doors must remain closed. For best results using one or more fans to assist air circulation between the rooms will be helpful. The Meaco 10L collects water in a bucket and when the bucket is full the dehumidifier automatically switches off. To avoid this, and the chore of emptying the bucket, the 10L is configured for continuous drainage. This is achieved by attaching a small plastic hose (supplied) to an outlet port in the dehumidifier and draining to a nearby drain or sink. The drainage depends on gravity so the drain must be lower than the outlet port in the dehumidifier. If you are taking advantage of this feature you will find that mounting the unit at a level a few feet above the floor will improve draining performance. The Meaco 10L dehumidifier incorporates a humidistat. Humidistat is the name given to a device that works in a way similar to a thermostat. It senses the level of relative humidity in a room and switches the dehumidifier compressor on when it rises above the programmed level and switches it off again when relative humidiity is restored to that level. This not only maintains a constant level of relative humidity but saves energy by preventing the compressor from running continuously. If you are unsure what level of relative humidity is best we suggest you should aim for a level of 50%. This should be sufficient to control condensation, prevent mould growth, deter dust mites and to maintain comfort for people. If you suffer from allergies this will be particularly important since both mould and dust mites are major sources of allergens and, to make matters worse, dust mites feed from material which has been partly broken down by mould. The Meaco 10L is simple to operate with electronic controls for all its major functions. It is ideal for small areas where space may be limited as it is a compact dehumidifier with a small foot-print of just 29.6 x 18.6cm and stands only 48.3cm tall. Moving the unit to clean around it, or from room to room, is easy as it is a light weight dehumidifier of 8.75Kg and is equipped with a top-mounted carrying handle. All dehumidifiers are noisy but the 10L is less noisy than most and produces only 46dB. We are not suggesting that this unit will not disturb a light sleeper if it is in the bedroom but the noise is no greater than a fan heater. In fact it is the fan required to move air in and out of the dehumidifier that is the main source of noise, although the compressor, for the refrigeration system, contributes too. In summary the Meaco 10L is an entirely competent dehumidifier for smaller areas of the home and at the asking price of around £100 represents good value for money. Consumer reviews of this dehumidifier have been very positive. In the areas for which it is designed (heated areas of flats and small homes) it is reported to be very effective. Many reports refer to the speed with which damp and condensation were removed and that mould did not return. Consumers who have commented like the apprearance of this dehumidifier and describe it as robust and well made. There are very few complaints about defects or early break-down. Consumers appreciate the ease with which this small dehumidifier can be moved due to its light weight and carrying handle. Comments about noise are mixed. Some who have owned dehumidifiers say it is quieter, others find the noise intrusive, especially at night. A few reviewers have expressed disappointment that this dehumidifier does not have a programmable timer. Some users find a full bucket difficult to remove without spillage. In our view the Meaco 10L Dehumidifier is an entirely effective, well featured small dehumidifier. It is positively reviewed by the majority of consumers and, provided it is used within the smaller areas for which it is designed and not in larger areas, or areas that are too cold, customer satisfaction is high. The Meaco 10L Dehumidifier represents good value for money and we are pleased to recommend it to our visitors.